Expenses are great. Whether you’re a sole trader or a limited company, you can claim back your allowable expenses and reduce your company profits, meaning less tax to pay on them. It literally pays to claim all your expenses. But, with great power comes great responsibility. There are various rules set out by HMRC around what you can claim as a sole trader business expenses or limited company business expenses, how to claim it, and how to store your records once you’ve claimed – and in order to take advantage of expenses’ tax-bill-reducing goodness you must follow the rules. People are often caught out by the last rule – proper storage of expense records. They claim, and the receipts go in the bin. Chucking out your receipts could land you in hot water though – so what are your obligations when storing your expense records? And what happens if you don’t adhere to the rules? How long do you have to keep expense receipts? For limited companies, six years. Yes – 72 long months. The self-employed (sole traders) have it slightly easier – just five years. This lengthy period is for HMRC’s benefit, rather than yours. HMRC can choose to investigate your accounts up to six years in the past, and if they decide to come calling you must be able to back up every expense claim you made during that period. It’s a good habit to use a spreadsheet to keep track of all your expenses – we’ve got a handy, free expenses spreadsheet you could use (we also got one for recording business mileage). What’s the best way to store records? As anyone who has ever held a rail season ticket will know, printed receipts are fragile things. Even a few weeks nestled at the bottom of a wallet is enough to render most illegible. If you’re a business that generates plenty of expenses, six years of records is a serious amount of paperwork too. HMRC recommend you keep all the original documents you receive. This does not mean you need to keep them on paper. Most records can be scanned and kept electronically on a computer or a storage device such as a CD or memory stick. HMRC asks you to keep the original documents which show you’ve had tax deducted. For example, if you’re an employee your P60 form from your employer (which shows your pay and tax information for the tax year). It’s also worth noting that “scanned” does not necessarily mean you need to invest in a scanner – as long as all the information is legible a photo from your smartphone is perfectly acceptable. If you’d like a more detailed run-down of how to keep records, you can check out our “What is bookkeeping and why does it matter?” article – or you can download our guide to read later. You can also learn more about the value of bookkeeping software for small businesses. Keeping secure digital records of your expense receipts is a piece of cake with the right kit. There are several apps you can use to scan, analyse and back up your receipts. Google’s ubiquitous productivity app has everything you need to scan and store your receipts. You can use the built-in scanning feature to turn paper documents into PDF scans with very respectable results. They’ll all be saved automatically and backed up safely. For an even more effortless approach, use the Dropbox app’s auto-backup feature. Every time you take a photo on your smartphone it’ll be whisked up into the cloud for safe keeping. You won’t get the fancy PDF conversion of Google Drive, but it’s just about the easiest method out there. For a custom-built expense recording solution, give Receipt Bank a try. The input is the same – a photo of a receipt – but the output is far more usable. 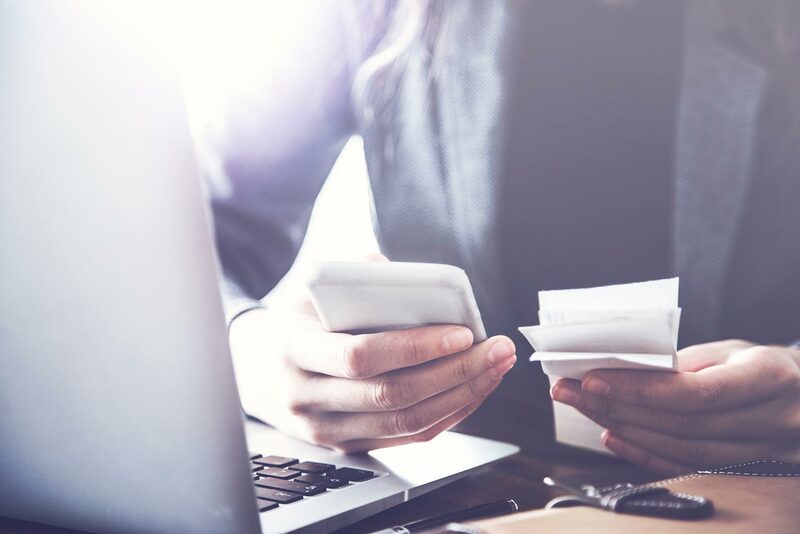 Receipt Bank’s secret sauce is that it will use clever technology to extract the pertinent data from your paperwork and give it back to you in a usable format, or feed it straight into your accounting software. All that power isn’t free though – a basic Receipt Bank account will cost you £9 per month. For Crunch limited company clients recording their expenses on the move, our very own mobile app “Snap” (developed in partnership with Receipt Bank) automatically captures receipt data and records it in your account. Our Crunch Plus clients get unlimited use of “Snap” included with their package, whilst Basic clients get 15 free scans per month, or you can upgrade to unlimited usage for just £5.50 per month. Business mileage expenses are slightly different to other expense types, in that there often won’t be a paper record the journey took place. Petrol is bought in bulk, and the only evidence you rode a bike to a meeting will be your toned thighs. For this reason, HMRC are willing to accept simply a list of journeys as a basis for a mileage expense claim. These records still have to be kept for the requisite six years though! There are a few options when recording mileage expenses. Crunch clients also get access to TripCatcher, a simple app to record business mileage when you’re out and about. Just enter the reason for the trip, how many miles you covered, and the mode of transport and TripCatcher will do the rest, even uploading the information to your Crunch account and calculating the VAT element of mileage if you’re VAT registered. Find out more about becoming a Crunch client. Perhaps the most straightforward way to record business mileage is in a simple spreadsheet. HMRC does not require an individual receipt for each trip, so a record in a spreadsheet is sufficient should HMRC require more evidence. You can grab a free Crunch business mileage spreadsheet here.